I absolutely agree; when you’re throwing down with a thirty-foot tall guy, it’s a really good time to update the New Avengers blog. That is exactly the kind of brilliant thinking that has rocketed the Avengers to the forefront of the superhero community. As for relevance in the context of the battle, it’s important that the good guys have a good photo of the thirty-foot-tall man. So that they can easily identify who to punch. Which they are already doing. I’m sure there’s a moral in here somewhere. New Avengers writer Brian Michael Bendis is a top-level comic writer responsible for half a dozen ongoing concerns. I’m sure there’s a witty pop culture reference here that I’m simply missing. Some obvious insight that should have hit between the eyes and forced a chuckle out of me. 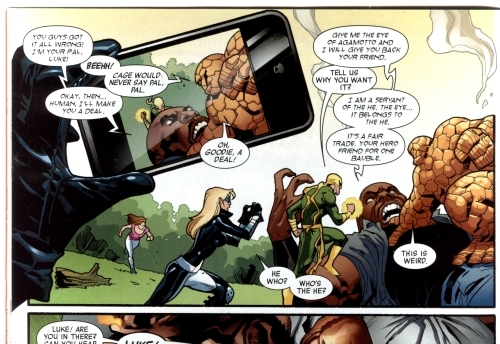 Instead, all I can see is that a superhero interrupted a fight to take a cell phone picture of it. Which, come to think of it, is the same thing that people did the last time I saw a real fist fight. Seriously, I don’t even know guys. 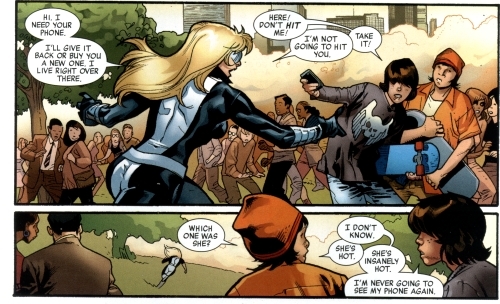 New Avengers (c) Marvel Entertainment; issue credits: Brian Michael Bendis and Stuart Immonen.